Inflatable waterslide party rentals are a must for your summer bash. Kids can have endless hours of fun while keeping cool at the same time. The perfect complement to any summer party is an inflatable waterslide. They require a rental from a professional party store and can be set up in your very own backyard. Waterslide party rentals come in a variety of styles and sizes. From sharks to animals, there are endless possibilities. They come in bright colors to liven up any celebration. 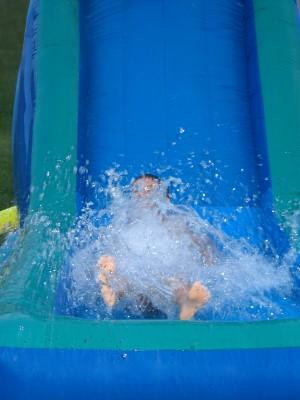 A waterslide is sure to be the center of your party and will bring enjoyment for all in attendance. You can easily turn an ordinary birthday party into an aquatic extravaganza. There is no need to drag the kids to a water park when you can create one at home. In addition to the waterslide rental, you can include other water activities such as water balloons, water guns and, if you have one, a swimming pool. The 18-foot slide is perfect for kids under the age of 13. The 27-foot slide will be an adventure for all ages. Shark Attack slide has dual lanes and is 33 feet tall. Waterpalooza has an 18-foot drop to the splash pool at the bottom of the slide. Kongo Krazy slide is 35 feet tall and has two sliding lanes. Dual Lane slide is a colorful dual-lane slide. Treehouse is almost 30 feet tall and is one of the most imaginative slides on the market. Kraken slide is a 28-foot dual-lane slide featuring a scary giant squid and an inflatable pirate ship. All rental waterslides can be used either wet or dry. This makes for more opportunites to enjoy the slides at your party in a variety of ways! The 24-foot Mega Water Slide features 4 separate arches for you to slide through. The 14-foot Water Slide is great for younger kids. Dual Lane Aqua Slide is the ultimate in party fun. Aqua Extreme can be used wet or dry and is not only a slide but an obstacle course as well. Slip 'N' Slide is set up like a car wash with 3 chambers labeled wet, dry and rinse. Set the inflatable up in an area that is large and open. Be sure that there is an adult at the party to supervise the activities. Make sure that the kids enter and slide in an organized fashion without pushing or shoving one another. Always obey all weight limits; many slides are not able to accommodate an adult. Most importantly, have fun and enjoy the waterslide. This feature will make a lasting impression and turn your party into an unforgettable event.